Guests in all suite categories can enjoy a FREE 3-Night Sydney and Beyond post-cruise land programme on this voyage. Australia and New Zealand now with savings of up to 25%*. 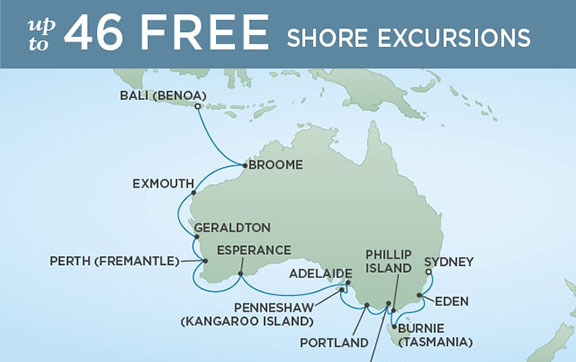 Guests in all suite categories can enjoy a FREE 3-Night Sydney and Beyond post-cruise land program on this voyage. The former health club and an observation lounge have been transformed into the ship’s new Canyon Ranch SpaClub. The serene and stylish wellness center has body and skin-care, massage and thalassotherapy treatment rooms, including a couples’ suite. Added is an aerobics studio and new gymnasium with cardio and strength-training machines, both affording forward-facing, panoramic ocean views. Locker rooms, including his and hers sauna and steam rooms, have been updated as has the full-service beauty salon, which features new wood cabinetry and granite accents. A juice bar and relaxation lounge are additional SpaClub amenities. The road to a richer life is paved with learning and new discoveries. That’s why Destination Services opens up a world of adventure for every taste and comfort level — whether it is on shore during your cruise or an adventurous beginning or end to your vacation. Private Arrangements can arrange personalized shore excursions, designed for smaller groups and according to your own interests. Or they can assist with tailor-made pre-and post-cruise programs, from a simple stay in a luxurious hotel to a 3-night extension in a remote locale. Whatever your desire, they can produce unique opportunities for a more intimate view. Well-stocked and exceedingly comfortable, the Library offers a most civil setting for reading and relaxing. Curl up with a classic novel, play a strategic game of chess or borrow a DVD from the library to watch in the privacy of your suite. Stay connected while sailing the seven seas in the staffed Internet Café, which is open round the clock and the ships have WiFi throughout for guests with their own laptops. Printers, e-mails, Internet access and Wireless access throughout the ship are all available for a nominal fee. For those in the gaming mood, a few hands of blackjack in the elegantly appointed Casino are the perfect draw. The Casino is located on Deck 7, and is open every day at sea when not restricted by territorial border limits. Blackjack, roulette, stud poker, mini-craps and slot machines are offered for the guests’ enjoyment. Located on Deck 11 aft, Galileo’s is the ideal place for cocktails or to simply relax and unwind with an after-dinner drink. The resident musicians entertain with familiar tunes during teatime as well as before and after dinner, with an opportunity for dancing. Game shows, night entertainment and live musical events are featured regularly. As the flagship restaurant aboard each of the ships, the wonderfully spacious Compass Rose serves breakfast, lunch and dinner and features an exceptional variety of European-inspired Continental cuisine, as well as flavorful vegetarian and kosher dishes and nutritious Canyon Ranch SpaClub® specialties. Elegantly decorated in warm golden and maroon hues, Compass Rose delights with a beautifully refined atmosphere blessed with natural light during the day. Whenever you decide to whet your appetite, your Maître D’ will guide you to a quiet, romantic table for two or a festive larger table — reservations are not necessary. The welcoming Reception Desk is open 24 hours a day and the staff is happy to answer your questions and provide any general assistance you may need. The Purser can be contacted at the Reception Desk as well. The Purser can change traveler’s checks and accepts payments of shipboard accounts at the end of the cruise. Postcards and letters can be dropped off here as well and will be delivered to the postal service at the next port of call.